No use of heavy weapons reported. The situation in the zone of the antiterrorist operation in Donbass remains controlled and is generally characterized by the observance of ceasefire, the ATO press center said on Facebook. Over the past day, the Russia-backed militants 20 times opened fire on the positions of Ukrainian military: eight times in Donetsk sector, nine in the Mariupol sector, and three in Luhansk sector. In Donetsk sector, the enemy held provocative attacks near Avdiyivka, using 82-mm mortars, grenade launchers, machine guns and small arms. In the vicinity of Verhnyotoretske and Luhanske the enemy fired machine guns and small arms. The terrorists fired grenade launchers Novoselivka. In Mariupol sector, the militants fired 82-mm mortars, grenade launchers and machine guns. In the area of Mariyinka and Starohnativka, the militants opened indiscriminate fire from small arms. The defenders of Shyrokyno were attacked from infantry fighting vehicles weaponry, machine guns and small arms. 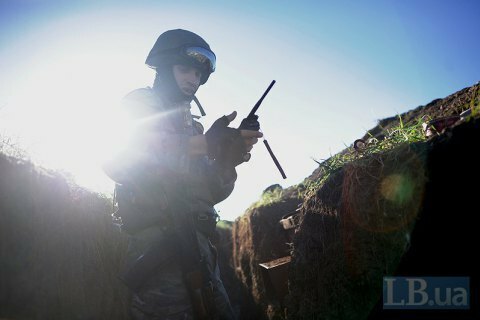 In Luhansk sector, Novoaleksandrovka was shelled from propelled grenades and machine guns, in the area of Popasna, the positions of Ukrainian were attacked from small arms. Heavy weapons have not been used. "The Armed Forces of Ukraine has steadily observed Minsk agreements," ATO headquarters stressed. Two civilians were reportedly injured in the shelling Verkhnyotoretske.